nOne and Three Chairs is an installation that intends to propose the conceptual plane of artistic practice as a semantic and representative structuring of reality. 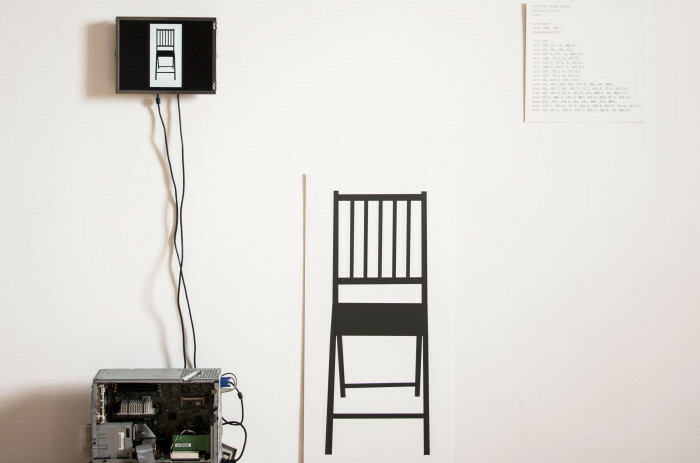 As the title suggests, nOne and Three Chairs is a reenactment of one of the most important artworks in conceptual art: One and three chairs by Joseph Kosuth, revisited with the focus into questions about a conception of what the digital form can be. Kosuth wanted to highlight the linguistic importance in a definition of reality, and the conceptual value of giving form to meanings. Kosuth’s artwork is composed of three elements corresponding to a single object yet offering different ways of how we can think about it. This is an ancient view of form which comprises skhēma (presentation) èidos (intelligible form), and morphé (sensitive form) that are all three represented by Kosuth. Here they undergo a radical and paradoxical change with the digital world. 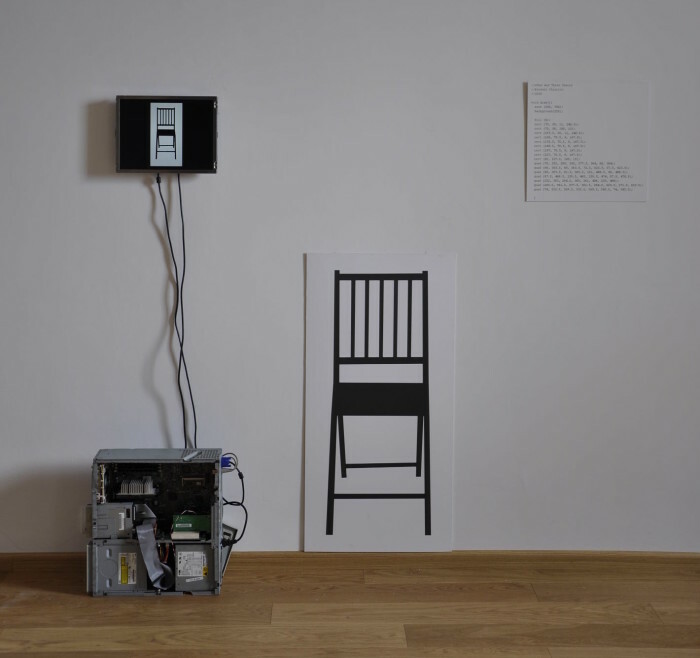 In the interpretation given in nOne and Three Chairs: skhēma (presentation) is represented by the monitor as a running process; èidos (intelligible form) is the digital code, as the only real structure of meaning, which leaves aside the interpretation and the subject of representation; lastly morphé (sensitive form) is the print of the chair, which presents a physical conclusion to the digital process.